Thanks to a handful of initial reviews from select press that surfaced close to last Friday’s embargo time, everyone thinks the Moto 360 has terrible battery life. Forget the fact that these reviewers couldn’t possibly have given the device thorough testing on its battery in the 12 hours (some less) that they had the watch in hand, but after having one on wrist for four days now, I think I can safely say that battery life is no where near as terrible as it was made to sound. 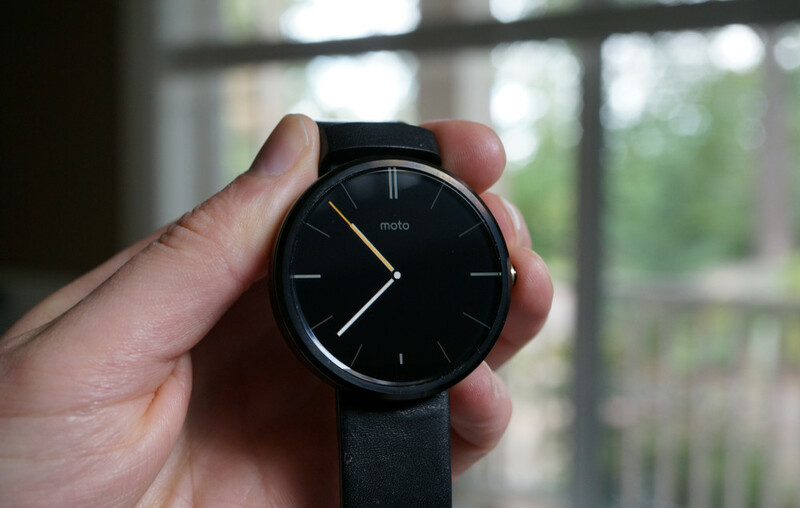 Let’s talk about the Moto 360 and some battery-related items. In my talk this morning about using the Moto 360 with Ambient Screen mode both on or off, I mentioned that I saw 13 hours of use with the mode on and around 14-16 hours (with 30% battery still remaining) with it off. What I didn’t mention in that post was the fact that the 13-hour day with Ambient Screen mode on was our initial testing and unboxing day. I was able to squeeze 13 hours out of the 360 on its first charge after having pulled it straight out of the box, charging it to max, and then proceeding to put it through a series of tests and videos. Clearly, we need to do more testing with Ambient Screen mode on, as that could improve. As far as using the watch with Ambient Screen mode off, we are talking 4.5% use per hour in my testing. If you calculate that out, you could get anywhere from 20-24 hours of use out of a single charge. I don’t know about you, but I’m not awake for 20 hours in a day, because I like to sleep at night. So let’s say you are awake for 16-18 hours per day, the Moto 360 should in theory, last you for a full day before needing the charger when you go to bed. You tell me if that’s good enough. Why should the 360 or any smartwatch last more than a day? With that last thought in mind, I’m wondering if we all shouldn’t re-set expectations for smartwatch battery life. Should it really be considered reasonable to expect a smartwatch with a color display to last for multiple days on a single charge? Your phone doesn’t last for more than a day in most cases, yet it has a battery 3-4 times the size of smartwatches like the 360 or G Watch. Sure, a phone does a lot more, but with a watch we are still talking about a computer that needs juice to power a full-color touch display, WiFi, Bluetooth, and other sensors. In the end, both are powered by the same terrible battery tech that hasn’t evolved in years, yet everyone has expectations set different because we are talking about watches. When you go to bed at night, what’s wrong with having to charge your watch next to your phone? Months ago, I would have told you that this idea sounds like something I wouldn’t want to be a part of, but I’m starting to realize that this is just the way it’s going to work if I want to own a smartwatch (it’s a lot like accepting the fact that all phones going forward will be huge and impossible to use with one hand). Thankfully, the Moto 360 doesn’t need a special adapter to charge, comes with its own Qi wireless charger, and can be set down on any other Qi charger to re-charge its battery. It doesn’t get much more convenient than that. 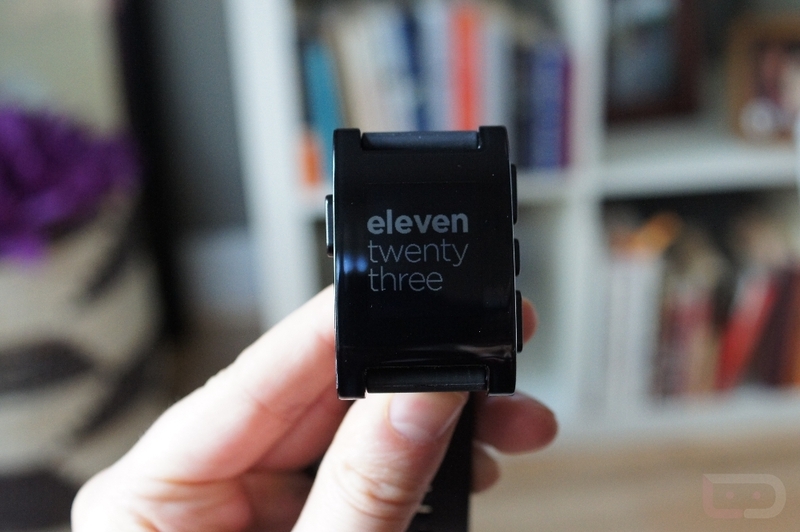 Maybe we have the Pebble to blame, since its e-paper display can last for a week without needing to be charged. Just keep in mind that the Pebble looks like, well like this. The Moto 360 and future LG watches look like finely tuned traditional time pieces that most humans would enjoy wearing. 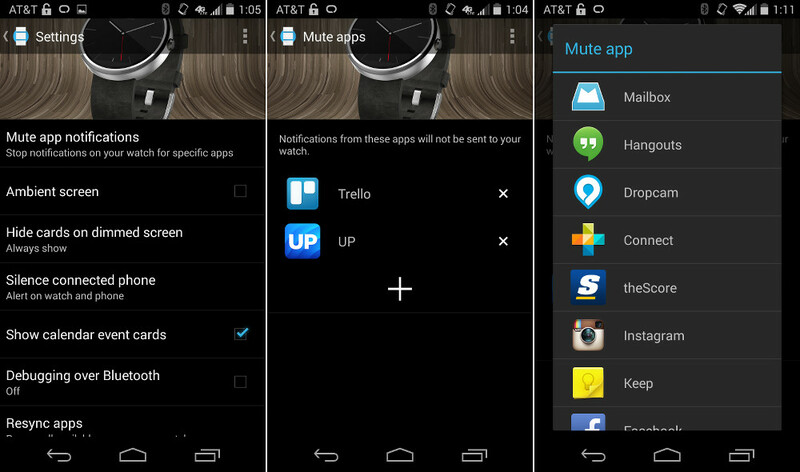 Set your watch up for you, manage notifications. If you want to extend the battery life of your smartwatch, there is one thing you should consider – minimizing its screen-on time by properly managing notifications. The display is going to gulp battery juice faster than anything when it is on, so you need to figure out a setup that can extend life. This starts by telling the Android Wear app which notifications should be allowed to come through in a day. Out of the box, your watch may receive it all (or most of it), since Google is still working on ways to make notification handling properly automated. Thankfully, you can manually add apps that you don’t want to see notifications from. For example, I don’t need to see every single notification from Trello, reddit is fun, and my Jawbone UP app. But, I do need to see them from Hangouts and Mailbox and my Dropcam. See where I am going here? Android Wear should be configured to give you the important info you need now that can be handled with a quick glance or voice command. If the notification is going to require all sorts of interaction, it may be better left only to your phone and outside of your smartwatch. Your watch is probably best served as an organized and customized extension of your phone, not an extension with a bunch of garbage thrown at it without your input. That type of setup is both overwhelming and an inefficient way of spending your time. Keep your watch in order, set it up efficiently, and your battery life should improve. In the end, I think you need to ask yourself if charging an additional device alongside your phone at night is something you are willing to accept. Because until battery tech improves, this is the way it’s going to be. You cannot expect a device with a beautiful, full color touch display and a 320mAh or 400mAh battery to last for days on end. If you can accept that fact, then the next step is to learn your watch, figure out how you want to interact with it, and then set it up properly. A properly used watch shouldn’t have a problem lasting you throughout a full day.